How many spoons do you start with? How many spoons does each task cost? 1. 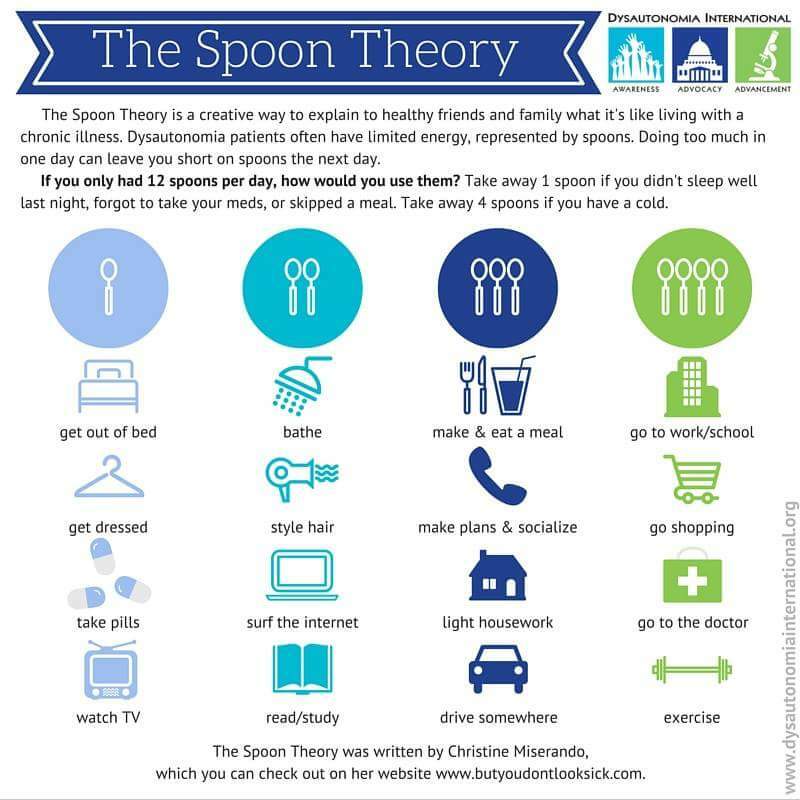 A healthy individual starts with an unlimited amount of spoons (energy), while a “spoonie” (a term used to describe those who fall under the spoon theory) could have, for example, seven to 15 depending on the day. There is no control over the number of spoons because with chronic illnesses, the person bearing them have no control. With a chronic pain syndrome, a spoonie could wake up one day feeling great and have 12 spoons, but wake up the next day feeling awful with six spoons – it as always out of control for the spoonie. 2. Every task costs a spoon. For a healthy person with an unlimited amount of spoons, this is no problem, but for a spoonie, even simple tasks can quickly cause them to run out of spoons. Getting ready for the day typically only costs one spoon for a healthy individual; however, for a spoonie, each task involved with getting ready cost a spoon. For example, it costs one spoon for getting out of bed, one spoon for showering, one spoon for getting dressed, one spoon to prepare and eat breakfast, etc. If a spoonie starts the day with eight spoons, at least four of those spoons have been used to get ready. That leaves half of their spoons to commute to school or work, complete multiple tasks, prepare lunch, commute home, prepare dinner, complete evening activities, etc. A spoonie knows they have limited spoons, thus they have to budget their spoons and tasks for the day. It is difficult for a spoonie to partake in social events because those require a lot of energy and usually spoons go towards essential tasks: getting ready, eating, going to work or school. If a spoonie goes to a social event (going to the movies, going to a party, hanging out with friends), it often shows love and trust in that relationship because the spoonie is willing to give up one of their limited spoons to spend time with those friends. This metaphor may sound silly and confusing, but it is a very helpful way to illustrate how draining illnesses can be. Imagine if you had the flu – you have very little energy to do anything so you lie in bed, rest, eat, and complete basic tasks. For individuals with fatigue based illnesses such as chronic pain, lupus, invisible illnesses, multiple sclerosis, and chronic fatigue syndrome, the body devotes the majority of its energy to try to combat the illness and the pain which leaves limited amounts of energy to devote to daily life activities. In the Spoon Theory, the limited amounts of energy are represented by spoons as a tangible way to show others the restricted amount of energy they have to work with every day. Spoon 1 – Wake up after poor sleep due to pain and get out of bed after 45 minutes of stretching and attempts to ease the pain. Spoon 2 – Shower, shave, brush teeth – all of which require a lot of muscle movement which leads to pain. Spoon 3 – Getting dressed which requires a lot of movement and thought. I have to think about the weather and environment because cold weather and air conditioning increases my pain so I may have to dress warmer, or if my shoulder is giving me a lot of pain, I need to find clothing that feels comfortable on my shoulder. You can have an open and honest conversation with your friend through this metaphor and once you run out of spoons, it will be eye-opening for your friend’s understanding of you and your illness. Encourage a friend to share their experiences with their illness through spoons or try to share your illness with a friend through spoons.